We launched our line of customizable Mama’s Day e-cards with hope: hope that our friends would like them and share them on each other’s Facebook walls. Hope that the blog entries we posted would be moving and eye-opening about aspects of motherhood that are usually overlooked. And hope that folks would connect with our basic message: All families matter. Our hopes were realized. Tens of thousands of people came to our website, and thousands made cards and shared them. 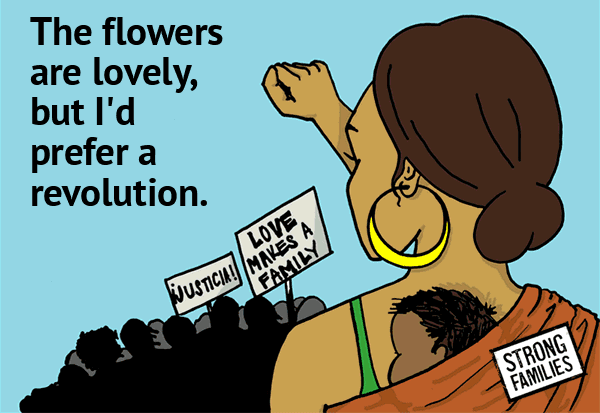 The e-cards received amazing coverage in the media, and MoveOn shared our cards in their Mother’s Day message. The cards traveled far beyond our own audience and took on a life of their own. Messages of appreciation poured into our offices from around the country—many people said they were moved to tears when they saw themselves reflected in our cards. Simultaneously, our blog exploded with content. We could barely keep up. We received beautiful, intimate pieces about the decision to parent (or not), raising boys of color, queerness, domestic violence, and disability, as well as many other mama-related stories of love and struggle. And we were thrilled by how many of you liked, shared, and loved these stories. We are inspired and humbled by the relief and joy expressed in response to our cards and blogs. We are excited by how many of you celebrated Mama’s Day with your communities. In this exchange, something deeper was revealed: images and stories of our families are not merely political, they are about imagining a world where the mamas in our lives are seen, heard, and valued. Our work at Strong Families is all about making that imagined world a reality. We are excited about creating a line of cards for next year, and are already hearing from artists who want to be a part of Mama’s Day 2013. But before that, there is an election season ahead. This is a season where candidates will likely shift between wooing our families as voters and donors, and scapegoating us for destroying marriage and the economy. Immigrant families, queer families, single parent families, and low-income folks will all come under attack. We won’t just be standing by watching these attacks. Strong Families will prepare all of our families to act and respond with Vote for Us: The Strong Families Guide to Civic Engagement. The guide will bring our vision and values to life so that the candidates we elect and the ballot initiatives we enact will improve life for all of our families. Working with members and partners, we will get hundreds of thousands of these voter guides to the families that need them. During this election season, we can to raise the voices of our families to speak for ourselves, challenge candidates to support our communities, and inspire everyday people to get active with us in this effort. Mama’s Day showed us how many of you are ready to act. We are so excited to move ahead with you.